An absolutely stunning Acropora. Branches develop a bright turquoise blue that can vary visually from greenish turquoise to bluish turquoise. Turquoise color runs half way up the corallite walls. Corallites are edged with a violet purple to violet blue pigment. 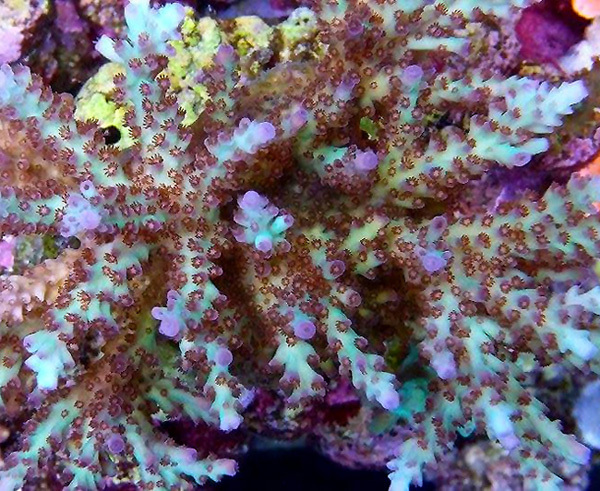 Polyps themselves are striking and have a complex pigment structure. Tentacles are brown with blue white tips. The base of tentacles develop red pigments while the center of the polyp is a light golden cream color. That creates a visible contrast between tentacles and polyp center. 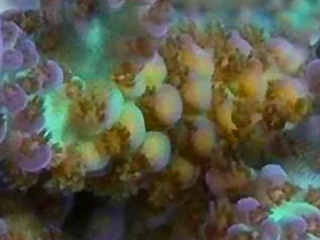 Some polyps develop an elongated tentacle that has a blue end. Occasionally a bright golden color can develop in tentacles and corallite walls (see bottom image). 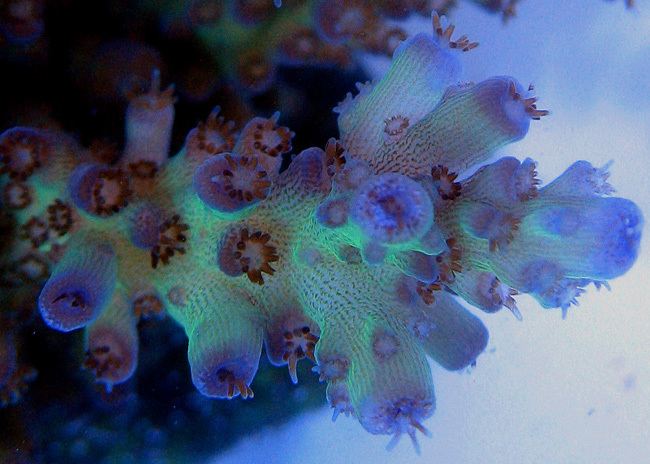 Julian’s Rainbow Acropora is named after Julian Hechavarria from the Chicago area. Julian is the founder of Elegant Corals LLC. He acquired this coral about 10 years ago in Schaumburg Illinois. He purchased it as a Rainbow and he had thought all these years that it was Joe’s Rainbow. Fairly obvious that this is not Joe’s Rainbow. There is only one other person who had a fragment of this incredible Acropora at the time Reeffarmers received our first edition and seed. Julian says the coral is very hardy, but he has nearly lost it on at least one occassion during those years. Reeffarmers did a double dip on our initial fragments and we noticed the tips showed some stress so this coral may be a little sensitive to dips. We double dipped with Revive and then Iodine. Reeffarmers is maintaining a seed section of this coral in a 8 foot Raceway Gyre BiZonal system. This system is naturally filtered with a semi-cryptic zone and a reef flat exposed zone. In this captive reef the coral is positioned to receive moderate light and moderate to weak water current. The first edition fragment of this coral was sold on our Buy It Now web page. Suggested list price on April 10th 2015 was $225 for a small fragment.